I don’t normally do predictions when it comes to football, but with three games left, why not have a go? I have looked at the fixtures remaining for the seven teams vying for the two play-off places still up for grabs and estimated (guessed) how many points each team will get. So here goes. Derby County have the advantage of four games left when all the rest have three, but that extra match is at home to Cardiff City. I have that one down as a draw. Derby also have to play Middlesbrough at home (a win for Derby) and Aston Villa away (a defeat), but they end up at home to Barnsley, which they will win and thus finish on 75 points. 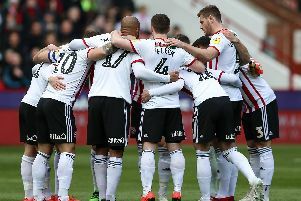 The only team that doesn’t have to play any of the other contenders is Brentford. I reckon they will win all three, against QPR, Barnsley and Hull City, so they will make 74 points. I have a feeling that Millwal will stutter at the last minute, considering they have to play Fulham, Boro and Villa. Two points from those three matches will leave them on 71, which is still a brilliant season for the likeable Neil Harris. Preston will win their two home games (Norwich and Burton) but will lose at Bramall Lane, ending with 72 points. Bristol City will beat Hull at home but draw with Forest away and United at home, so they get 70 points. The observant will have noticed that I’ve got United beating Preston and drawing at Bristol City. We will also beat Birmingham (that’s a bold forecast), so ending up with 73 points. Who haven’t I mentioned yet? Middlesbrough. Despite losing at Derby they will win their last two (Millwall at home, Ipswich Town away) to total 75 points. Adding all that up and boiling it all down, it means that Derby County and Middlesbrough will finish fifth and sixth (they were expected to at least make the play-offs anyway), with Brentford 7th, United 8th, Preston 9th, Millwall 10th and Bristol City 11th. None of those five were expected to make it anyway. The gap from fifth to 11th will be five points. It’s all a bit of fun, and it will probably finish up nothing like this. Whatever happens, United have had a great season, mostly exciting to watch, and we have given some big, rich teams a real hard time.